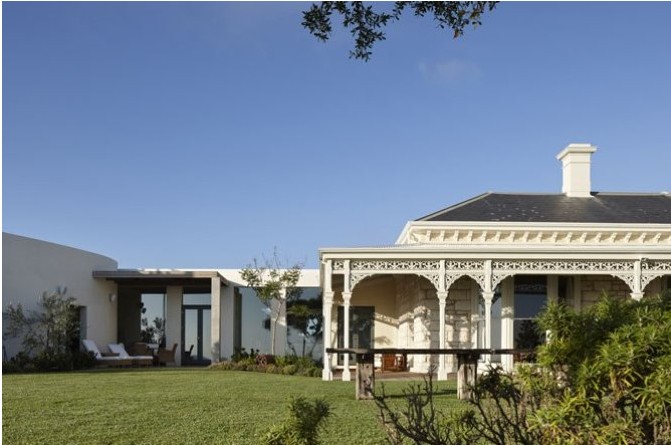 The house, known as the Anchorage is located on the crest of a hill overlooking the harbour in Sorrento Victoria. It is a Victorian villa built in local limestone in 1873 as a holiday house for comedian, philanthropist and businessman George Coppin and his family. It is heritage listed and is considered to be both architecturally and historically significant. 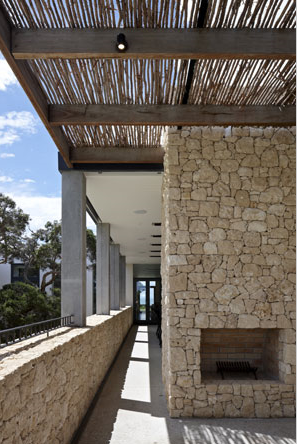 The Architects chosen for this renovation were Allan Powell and Ed Glenn from Melbourne based Allan Powell Architects. The owner’s brief was to bring the building into the 21st Century. They asked for a large summerhouse for family and friends but one that could also be cosy and closed off for them as a couple to enjoy. The approach the architects took with this house was to hide any renovation from the front door and allow it to be revealed as you wander through the home. As Ed Glenn explains “Instead of arriving and looking through to the extension, you arrive and look through a big window to the garden. “ He argues that “If you can find the right way to use and connect them visually, old Victorian rooms are not as obsolete as people think they are. Victorian rooms should be enlivened by the extension. The Victorian rooms have been repurposed for the couple with two boxlike rooms looking through to the water. The bedroom is on the other side of the hallway, designed such that when you wake in the morning you look through a Victorian lounge to the view. The Anchorage extension caters for the guests includes a wine bar downstairs, a big rumpus room, an extra four bedrooms, a games room, a gym and a day spa area. It is not Victorian in style but Allan explains “does not offend the Victorian part of the house”. The Victorian section is built with large pieces of dressed stone. Smaller pieces and rubble would apparently have been used for stables and the garden sheds. The architects designed the extension in keeping with this, crafting it with rubble walls. This meant the scale was limited to a height that the stones could realistically be stacked. 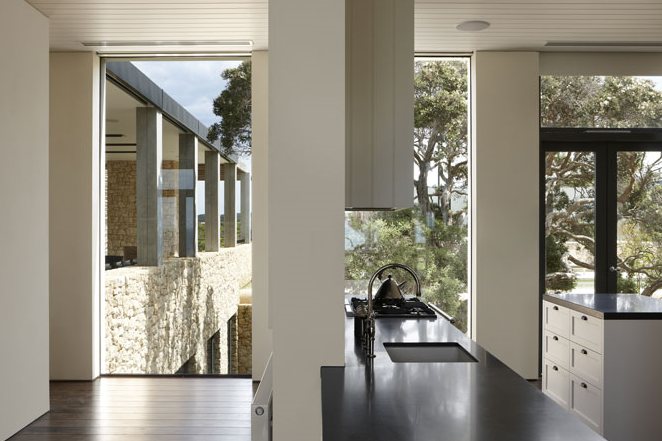 They avoided the use of large glass walls despite the magnificent views to give the owners a sense of being contained. The land around the house was subdivided prior to the renovation so alterations needed to consider and work with the impact of what may be built next door. The architects decided to use a natural rock face to block out any new buildings. In order to retain a country estate feel they needed to isolate the house and its landscape from its surroundings. 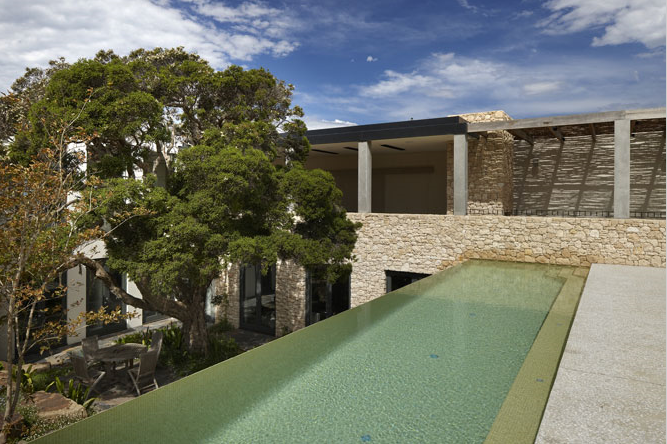 The design incorporated a row of Norfolk Pines, a large Moonah tree and expansive lawn between the house and the sea. 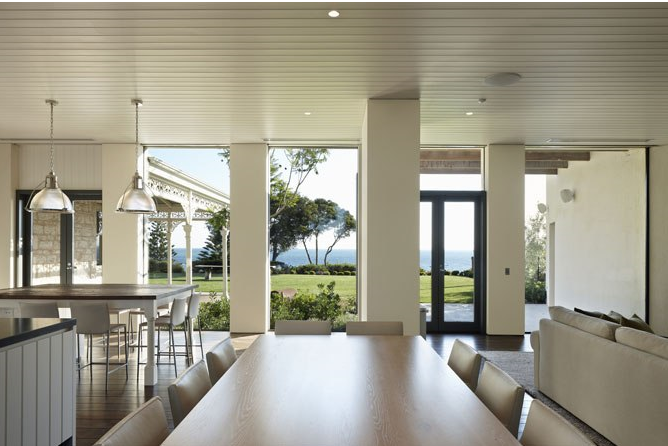 It was decided to locate a pool as the rear of the house, so it did not compromise the lawn or water views and to protect it from prevailing winds. Car-parking was placed under the tennis court and a storage area hidden from view. The Architect describes this approach as “de-suburbanised”. The architects have said that “clients come to us when the design matters – when every bit of the design is important”. In this case their design is sympathetic to the beautiful original building and the environment in which it stands; but it is also a very contemporary addition and a practical solution to the needs of their clients.